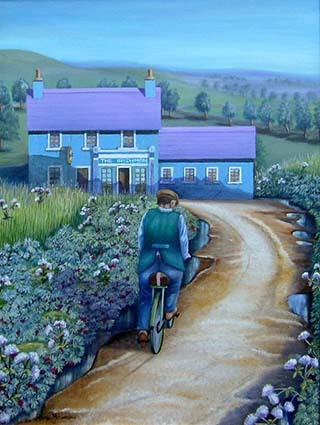 Inspired by a scene while traveling in Ireland where I saw a man riding his bike up a hill. Later I saw his bike leaning against the wall of the local pub. I then repainted the scene as it was enjoyed so much. This painting was so popular I did three more versions of it. Might do another!